After seeking solace in a hearty winter veggie soup for lunch, I’m thinking of turning a roast chicken dinner leftovers into a warming chicken and mushroom pie this evening, with either roast potatoes or mash – I haven’t decided yet. I hope you will have something tasty to warm up your stomach tonight. …and it turns out that a very very sweet baby girl was born not long after I wrote on Wednesday, so the little booties are winging their way across to her. I also thought the card I found was quite adorable, so I took a little photo of it before scribbling in it and sending it away. Categories: Frivolous Fridays, simple suppers | Tags: baby booties, baby girl, British Isles, chicken and mushroom pie, Patons, roast, UK, weather, winter, wool | Permalink. Hello everyone! I’ve missed this space so much! I’ve been really busy though and in the bid to stay focused, am currently not writing very often as you may have noticed. I was busy in May relaxing at one wedding and then playing wedding planner/organiser for another. Things haven’t stopped since (except the sunshine)! Even – or rather especially – when one is a little overwhelmed, it is very important to eat properly. I must concede that that’s easier said than done. I prefer a weekly (or even bi-weekly) shop when I’m busy. This has been a bit awkward lately, as my shoulder niggles have also resurfaced, making it unsafe for me to drive and unwise for me to carry heavy loads. Back to eating well though – my favourite way to achieve this whether or not I’m busy, is with leftovers. Making the effort you’ve made, last that little bit longer. I’ve never thrown food away easily, and eating leftovers is in my blood. 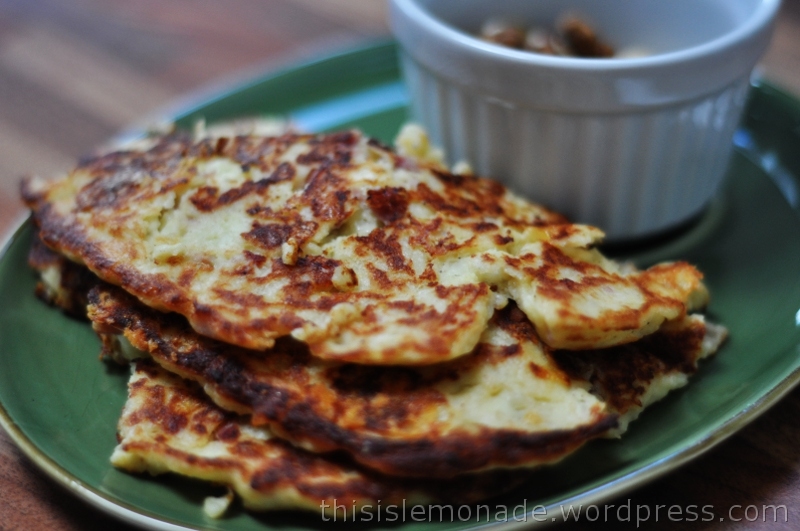 I do love changing things up a little though, so here are three recent variations on supper! Roast chicken dinner turned into cold chicken with potato cake. One of the foods that make me feel cosy, is simple roast chicken eaten straight from the fridge the next day. It’s always so delicious! For the potato cake, I added some wheat germ to the crushed roast potatoes for extra fibre that I can’t do without, diced all the veg and mixed it up. Then I cracked in an egg to bind it all together and squashed it into a cake and fried it in a little oil! Try adding some cumin or curry powder for a new flavour to your roast potatoes! I always cook too many potatoes when I make a roast dinner. It’s always accidental, but I do love my potatoes, I just can’t help it! I made another more hash-like potato cake when I’d run out of the roast veg, but needed a little something before I cooked supper again. I don’t know about you, but I can’t cook on an empty stomach. I end up eating junk and overfilling my stomach before the main meal! This is a simple little amalgamation of crushed roast potatoes, with some grated cheese mixed in and an egg cooked in pretty much the same way as above. It turned out crispier as I flattened it out more. I served this indulgent little pre-dinner feast with some nuts. When you know dinner is going to be late, having some proper food early evening means you don’t need to eat too much too late at night. I don’t know about you, but I don’t sleep well on a full stomach. I hope you enjoy these ideas. They are simple, but magical – making them doesn’t take much longer than it would to pierce the lid of a ready meal and stick it in the microwave. They are also satisfying, not just for the taste buds, but for the mind too. A rewarding way to exercise your creative muscles briefly and get near instant yummy results! And you will notice there aren’t that many veggies here. When I’m busy, I try to make sure I’m well stocked on fruit – now that’s real instant food! 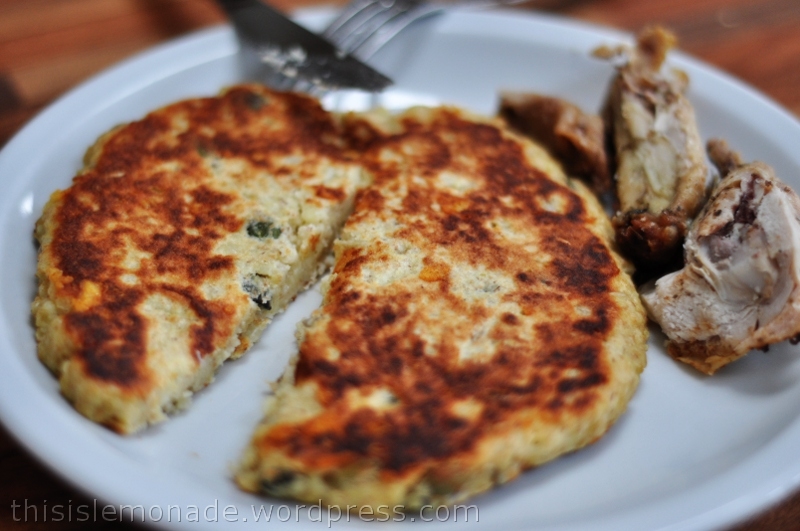 Categories: Food & Drink, simple suppers, Tasty Tuesdays | Tags: blogging, cold chicken, dinner, easy food, eating well, left overs, potato cake, potato hash, sandwich | Permalink. 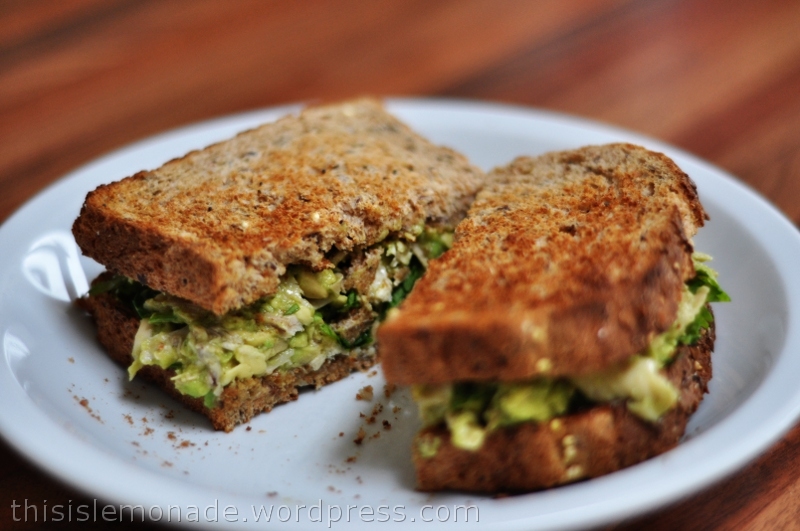 I got some light protest in the comments under my first Tasty Toasties post. Some of you were of the opinion that the addition of cheese would have been in good order. I do not disagree. I usually have cheese on the brain, and this has been the case ever since I left the cheese out on my posh beans on toast. I have well and truly learned my lesson. This quick toastie has two cheeses: a cheddar from The Lake District Cheese Co. (I had to include a link because it’s such a cute site!) and a lovely crumbly and tangy Lancashire cheese. I don’t know about the part of the world you are in, but London has been finally launched feet first into spring. It is as though the sun saw the calendar and was as surprised as me. What? It’s March already? Huh? I haven’t shone yet this year, hurry! And we’ve had five days of sunshine straight (or at least that’s how I remember it to be). It’s still cold, but there are signs of busy spring activity already. Green shoots poking through everywhere, and birds and squirrels getting all excited, suddenly full of life and bustling about. I spent five minutes watching a squirrel running to and fro, checking up on its stash of snacks in the garden earlier. It happily polished one of them off, then proceeded to lick itself all over and stretch about in the sun before prancing off along the fence. So that’s the backdrop to today’s uncomplicated toastie. 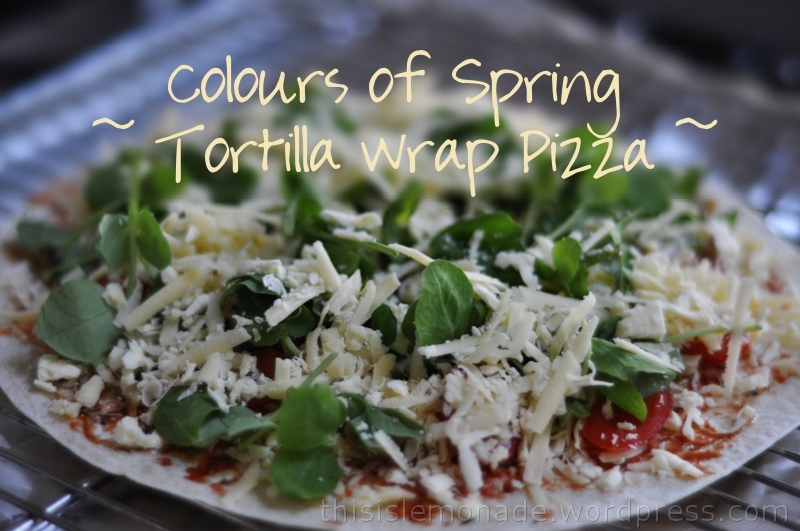 I prefer thin crust pizzas so this is right up my street, but to be honest, it’s just as easy to roll it up and eat it like a wrap, I might do that next time.. I put it in the oven, ten minutes at 200°C or about 395°F – basically, until the cheese melts into that bubbly, oozy goodness we all love. After taking it out of the oven, I finished it off with some extra virgin olive oil and balsamic vinegar, then cracked some black pepper on top. Even if it rains tomorrow, I’ll be satisfied, because today I celebrated some lovely spring sunshine with a cheery toastie while it lasted. Did you set yourself any goals for last month? If yes, how did you do? If you need any cheering up, I hope today’s little bite of spring helps – have a good week! 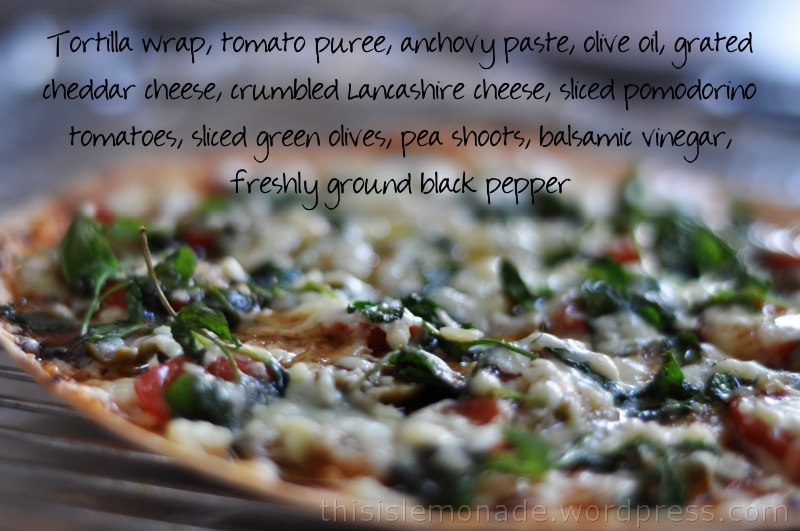 Categories: simple suppers, Tasty Tuesdays | Tags: anchovy paste, balsamic vinegar, cheddar, goals, Lancashire cheese, olive oil, olives, pea shoots, photography, pizza, pomodorino tomatoes, spring, squirrels, tomato puree, tortilla wrap | Permalink. I’ve always enjoyed getting creative in the kitchen, but lacked confidence to share it with others. My style is not sophisticated, neither is it unique. I just love feeding people and having them gather around my table. The culture of eating together, was something I was brought up with. Whenever I have lived with at least one other person, I have rarely eaten alone of an evening. And when I lived alone, I was always gathering friends round to share one pot wonders with. My food tends to be low-key and as low-fuss as possible. I have always cooked creatively but frugally. People will compliment me on my cooking from time to time, but more often than not they simply emit polite murmurs of appreciation as they tuck in. My food does not become the specific subject of conversation at the table, although we are a greedy lot – future meals or interesting ingredients are often discussed whilst we eat! For me, a shared meal is about providing nourishment for the body but more importantly, it is about togetherness and conversation – food for the soul. I often eat late now, I cook and then wait for my munching partner. And by the time we eat, the food has been kept warm to death. I am ravenous and food is food. A dinner is polished off in much less time than it took to prepare and cook it. However, as I blogged over the past year, I came to realise how much I enjoy cooking and eating my own food. I have my trusted favourites, my store cupboard staples, my preferences and routines, but discovering and exchanging lots of ideas with other bloggers has given me the impetus to explore further. What a wonderful invention is the oven. And what a wonderful climate we have in the UK to use it. In recent years, I have not even broken sweat when using the oven in summer. One of my favourite things to do is to roast a chicken, together with potatoes and root veg. I marinade the chicken, or simply rub it in olive oil, salt and pepper. I then cube potatoes and root veg in similar sizes and toss those in the same. I’ll time it so that the veg gets about 45-60 minutes in the oven, so if the chicken needs longer, I will add the veg into the roasting tin later. Even though I generally consider myself a healthy eater, I do have an addiction a soft spot for crisps. I’ll eat my potatoes made any way, but I love them fried or even double and triple fried (by a restaurant – I hate deep fat frying at home). So imagine my excitement when Pinterest kept throwing up these little beauties… a concertina of crispiness called Hasselback Potatoes. I just had to experiment with them myself. They are baked, and the only difference I could tell between making these and my roasted easies was that you sliced them through (almost) whole first, before baking. Oh, and it’s best not to put them in with the chicken I imagine. The yummy chicken juices soaking into the potatoes will not be conducive to crispiness-making. Well.. unusually, there are no photos with this post even though I took some. I just felt like having another go at drawing again. But I did stumble across a cute little article complete with videos, if you want to amuse yourself taking photos of food in a restaurant. Categories: simple suppers, Tasty Tuesdays | Tags: baking, blogging, chicken, cooking, culture, drawing, food, hasselback, inspiration, Pinterest, potato, roast | Permalink. I find when many people write reviews about places to eat out, they seek out interesting cuisines and wonderful décor and presentation. I love ogling the resulting photos showing amazing things that I would never think of doing with food. When I eat out however, it’s usually because I have been terrible at planning and I’m too tired to cook. It’s often also a bit later than the average supper time, so I’m not really looking for adventure, it’s more a question of having a night off from cooking in a comfortable setting. So with that in mind, my top priority for places to eat are where I know I can relax, and trust the restaurant staff to be generally attentive and friendly. Maybe it’s just me, but does anyone else find the service in restaurants has not been all that great for a while? And I’m not talking about highbrow places where I could be accused of lowering the tone of the restaurant with my half asleep look. I hope you don’t think I’m asking for much – it’s just that someone who delivers the food or gives you the bill as though they were holding a grudge against you doesn’t usually do much to aid digestion. I wonder if perhaps the recent trend for restaurants to slap the 10-15% “service charge” automatically on the end of your bill doesn’t help. I’d like to think this isn’t the only reason. Perhaps diners have also become less polite in recent years. However, the restaurant I am about to tell you about still does it the old fashioned way. In fact, you aren’t even allowed to enter a tip on the card machine. If you have no change, you can’t tip at all – much to my disappointment, the first time I visited. This restaurant is not particularly spectacular in terms of credentials. It is not tucked away in some hidden alley, serving amazing fresh produce grown from a drainpipe. No amazing stories to tell there. In fact, it is one in a chain of six in London and I have no idea how authentic the food is because I have never been to Greece and I do not know anyone who is really clued up about real Greek food. It is in fact one of the food outlets at the Westfield Stratford City shopping centre, next to the now slumbering Olympic Park. Nothing at Westfield can be called a bargain, but this is one of the less expensive restaurants on that side of Stratford. I thought I would review it since it is a place I have been served well on three occasions. Incidentally, if you have a voucher for any chain store/restaurant, check before you try and use it at Westfield. You will notice that some offers are not valid there. On this occasion, we ordered the Tabouleh Salad, Loukaniko Country Sausage and Dolmades which came on a tiered sharing platter. We also had some saffron rice and Tiropitakia because I can never pass on cheese wrapped in delicate pastry. On other occasions I have tried the Greek Flatbread with Olive Oil & Dukkah, Htipiti, Gigandes Plaki, Lahanosalata and a set basket of wraps which I cannot find in the online menu. All of the offerings were very reasonable and in good sized portions. It is impossible to take good photos in the restaurant in most of the areas, because the evening lighting is not designed to aid food photography. My apologies to the restaurant as the one half-acceptable result may not look all that appetising to all, so here’s a link to the menu so that you can better imagine what I ate. I think you will agree however, that the lamp shades are rather nice and cheerful. As with all of the Westfield shops and restaurants, the design and layout is really nice. I especially like the pretty doors to the restaurant and I must also point out that they serve tap water in lovely cobalt blue enamel jugs. Bearing in mind the context of my requirements and limited experience of Greek cuisine, I have thrice been a happy customer. The staff have been cheerful and relaxed at all times (on this occasion, there was a rather rowdy lively birthday party going on) and I have been served in good time with tasty grub. This is one of the few restaurants where I can also leave after the meal without having to resort to performing a rain dance to attract somebody to take my money. And since my first experience, I have made sure that I have cash in my pocket before I sit down so as not to have to leave a few sad coppers languishing on the table after paying the bill. Categories: simple suppers, Tasty Tuesdays | Tags: food, London, Olympic Park, photography, restaurants, reviews, service, Stratford, The Real Greek, waiters, Westfield | Permalink.